20 Irish organisations are among the signatories, including the Irish Congress of Trade Unions, Afri, Sinn Fein, Anti-Austerity Alliance-People Before Profit, the Green Party, the Ireland-Palestine Solidartity Campaign, Academics for Palestine and Sadaka (full list below). Others in the 356 strong list of signatories include: Transform! Europe – a european network of 28 European organizations from 19 countries, The Norwegian United Federation of Trade Unions, Parti de Gauche in France, Podemos in Spain, Norwegian Church Aid, major Belgian NGO coalition CNCD 11.11.11, Defence for Children in Belgium, the international catholic peace movement Pax Christi International in Belgium and major French Catholic NGO Terre Solidaire. See here for letter and full list of signatories. 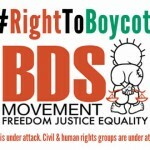 Enough with the criminalisation of the BDS movement for justice in Palestine! 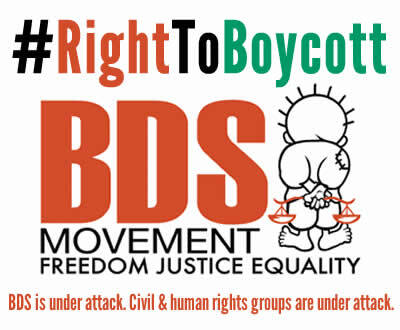 Let’s support right2BDS! 289. Mujeres en Zona de Conflicto – M.Z.C.